As if the world economy did not have enough problems already, now the riots in Egypt threaten to send the price of oil soaring into the stratosphere. On Friday, the price of U.S. crude soared 4 percent. A 4 percent rise in a single day is pretty staggering. The price of Brent crude in London closed just under the magic $100 a barrel mark at $99.42. The incredibly violent riots in Egypt have financial markets all over the globe on edge right now. Any time there is violence or war in the Middle East it has a dramatic impact on financial markets, but this time things seem even more serious than usual. Many believe that we could see an entirely new Egyptian government emerge out of this crisis, and the uncertainty that would bring would make investors all around the globe nervous. Financial markets like predictability, peace and security. If Egyptian President Hosni Mubarak’s 30 year reign is brought to an end, it will severely shake up the entire region, and that will not be good news for the global economy. Have you seen how violent these protests have become? Cars and buildings are on fire all over the place. Even the headquarters of Hosni Mubarak’s political party was burned down. 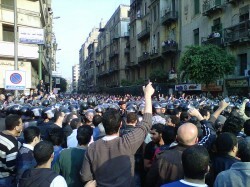 The Egyptian military has been deployed on the streets of Cairo. Protesters have been showering government forces with stones, firebombs and anything else that they can find to throw. Security forces have been using rubber bullets, water cannons and tear gas to try to disperse the protesters but those efforts seem to be doing little good. Deaths and injuries are being reported all over the place. There are even rumors that the wife and son of Hosni Mubarak have already left the country. At this point, Mubarak has gone on national television and has announced that he has asked his cabinet to resign. That is an absolutely stunning move, but it is doubtful that the protesters will be satisfied. All over Cairo protesters continue to chant for Mubarak to resign. The following is a short compilation of some raw video from the riots in Egypt…. These riots in Egypt come on the heels of violent uprisings in Algeria and Tunisia. In fact, it seems like virtually the entire Middle East is in a very foul mood right now. Riots have been reported in Lebanon, in Jordan and in Yemen over the past few days. Some of the rioting has been motivated by economic factors, but unfortunately all of this rioting is only going to make the global economic situation even worse. Concern over all of these riots is driving up the price of oil and driving up the prices of agricultural commodities. These higher prices are going to make it even harder for the poor people in the Middle East to afford food. But also it must be acknowledged that much of this rioting is being done for very deep political and religious reasons as well. Many westerners are cheering the protests in Egypt because they envision the protesters to be some sort of “freedom fighters”. But the vast majority of these protesters do not desire “American-style democracy”. The Muslim Brotherhood is one of the groups at the heart of these protests. The government that they intend to set up would not give “liberty and freedom for all”. Rather, it would be a hardline Islamic government based on Shariah law. According to Wikipedia, the Muslim Brotherhood bills itself as the “world’s most influential Islamist movement”, and their goal is to impose their version of Islam on society…. So unless your version of “freedom” includes being forced to live like the Taliban, then you probably would not enjoy the “liberty” that the Muslim Brotherhood wishes to impose on you. Coptic Christians all over Egypt are already being slaughtered even with a relatively pro-western president in power. On New Year’s Day, an attack on a Coptic Christian church in Egypt killed 21 people. The following is how one eyewitness described the scene to a reporter from the New York Times…. Once a radical Islamic government is installed in Egypt it will be open season on all Christians. Yes, there is a whole lot of blame to be passed around to other nations, organizations and individuals in the Middle East for things they have done as well, but that does not excuse the horrific persecution of the Coptic Christians in Egypt. We have to call a spade a spade. We cannot condemn some forms of tyranny and persecution and then make excuses for other forms of tyranny and persecution just because those doing it are on “our side”. Replacing one form of tyranny (Mubarak) with an even more repressive form of tyranny (The Muslim Brotherhood) is not something that those who love liberty and freedom should be celebrating. In any event, everyone should be able to agree that these events are going to severely rattle world financial markets that were already very nervous about 2011. If these violent riots in Egypt and other countries in the Middle East keep going on, the global price of oil and the global price of food will continue to soar. Not that oil and food were not going to be heading in that direction anyway. Yesterday I wrote about the warning signs for the global economy that we are starting to see. Wheat and corn have absolutely skyrocketed in price over the past 6 months. The UN had already been projecting that we would see a 30 percent increase in the global price of food in 2011 even before these riots. If you add rampant political instability into the mix, there is no telling how bad food inflation could get this year. Many experts have already been forecasting substantial food shortages throughout the world this year based on all the extreme weather we have been having. So what is going to happen if something causes those food shortages to be even worse than anticipated? We live in very interesting times my friends. The globe is becoming an increasingly unstable place. Even nations that seemed perfectly stable just a few months ago can erupt in rioting at almost any moment. People around the world are getting angry. Thanks to the Internet, people are able to circumvent official government propaganda more easily than ever before. This is making it harder and harder for governments to control people. Egypt tried to regain some of that control during the riots by shutting down cell phones and by shutting down the Internet but it did not work. Let’s just hope that Egypt can soon find peace and that the changes that are made in the Egyptian government are good for freedom and liberty.